If your student struggles with these basic facts, then I’m recommending using a program called Xtra math. The website is xtramath.org I have used it to help students that I’ve worked with outside of school. I’ve found it to be very beneficial to helping them and me see which facts they know and which ones they struggle on. If you’d like me to add your student to my account roster, please let me know and I will add them. I will also provide you with my login info so you can work with them and monitor them on your end. This can really provide good data points and increase self-esteem in becoming better mathematicians in the classroom. 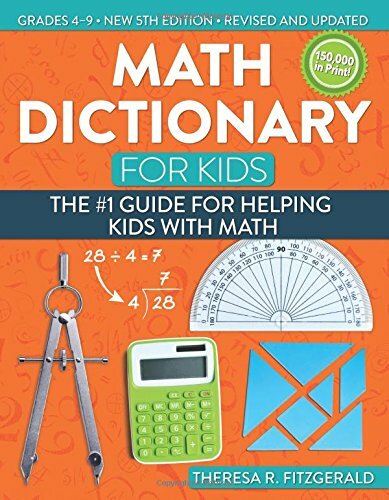 The book Math Dictionary for Kids by T. Fitzgerald is a wonderful resource for students grade 4-9. It is easy to navigate and is adult as well as kid friendly. It is a completly optional purchase. I’m attaching a link to Amazon below for you to view. It is also available at Barnes & Noble.